Kirstine Kirkegaard, M.D., Johnny Juhl Hindkjaer, M.Sc., Hans Jakob Ingerslev, D.M.Sc. 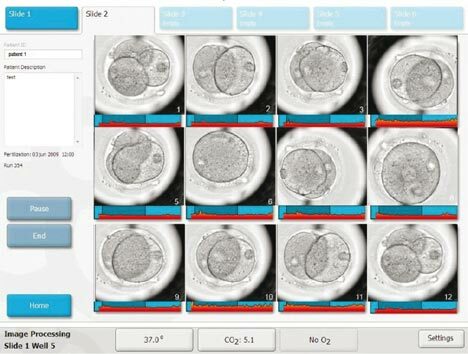 To evaluate the temporal influence of culture in 5% O2 or 20% O2 on the human embryonic development using time-lapse monitoring. In vitro fertilized embryos from women aged < 38 years with no endometriosis and > 8 oocytes retrieved. Culture in 20% O2 exclusively (group 1), 20% and 5% O2 combined (group 2) or 5% O2 exclusively (group 3). Developmental rates and timing of developmental stages. The timing of the third cleavage cycle was delayed for embryos cultured in 20% O2 (group 1) compared with embryos cultured in 5% O2 (groups 2 and 3). No difference was observed with regard to timing of the early and full blastocyst stages. More embryos in group 2 and 3 reached the 8-cell, early and full blastocyst stages than in group 1. We found that embryos in group 3 (5% O2) reached the 8-cell stage faster than embryos in group 2 (5%+20% O2), but none of the parameters (i.e. other time-points, cumulative development and embryo score) differed between the two groups. Culture in 20% reduces developmental rates and delays completion of the 3rd cell cycle. The delayed development after culture in atmospheric oxygen was seen in the precompaction embryo only and thus appears to be stage-specific.